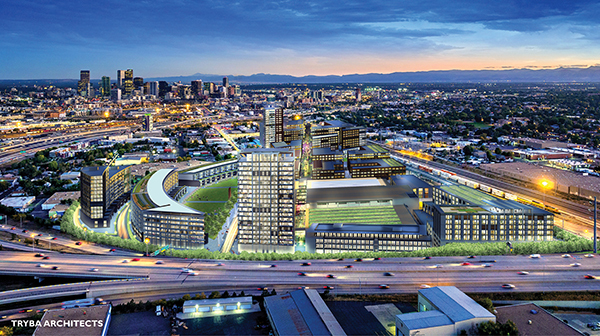 A rendering of hypothetical development for the former Denver Post plant site. Credit: Tryba Architects. The Denver City Council has approved the rezoning of The Denver Post’s former printing plant in Globeville, the latest step toward the property owner’s vision of seeing the 41 unused acres become a mixed-use neighborhood with structures as tall as 12 stories. Council voted 9-3 last month to rezone the approximately 30-acre parcel at 4400 Fox St., after having previously approved rezoning of the adjacent 11 acres at 700 W. 44th Ave. and 4300 Fox St. parcels. The council also voted 8-3, with one member abstaining, to approve the landowner’s broad development plan for the site. The rezoning was requested by property owner Ascendant Capital Partners DNA LLC, which purchased the property in February 2008 for $17.1 million from the Post. The printing plant moved that year to Adams County. Inside the former printing plant of The Denver Post. and Denver-based Ascendant Development are the managing members of the LLC that owns the property. He said Tryba Architects was hired for the project. Woodspear Properties owns approximately 2,100 apartment units and 20 commercial properties in Colorado, Washington, Arizona and California. Ascendant has primarily developed flex-industrial properties in Colorado, Kessler said. 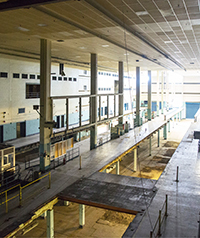 The former printing plant, the only structure on the property, is nearly 300,000 square feet. Since the Post left in 2008, the property has had only occasional temporary use, by flea markets and festivals. The current owners do not plan to develop the site themselves, Kessler said. Instead, they are going through the entitlements process, and hoping to sell the entire site to another entity, which likely then would divide the site into parcels and sell to multiple developers. The site has been on the market for about four years, Kessler said, declining to name the price. Brokers Marty and Eric Roth with CBRE are representing the owners. The plan envisions about 3,000 people could ultimately live at the site in the future. Kessler said the site plan has changed since the 2008 purchase, when the owners anticipated that at least a portion of the former printing plant would be torn down, and that the focus would be on industrial development. Partially, Kessler said, the change is due to the light-rail station now at 41st and Fox, which was supposed to be built farther away. “We want from being several blocks from the station to our southern edge being one block away,” Kessler said. Additionally, Kessler said, the Denver real estate market has grown fast. “There became interest in various markets in these larger scale re-use projects,” Kessler said. Fox North isn’t the only site within the core of Denver sprouting a new neighborhood. The owner of amusement park Elitch Gardens wants to eventually turn the site into The River Mile, and has shown renderings with towers at the site rivaling the height of those in the Central Business District. And the Denver Broncos want to build an entertainment district south of the team’s stadium. Kessler said Ascendant Capital Partners DNA LLC, along with other neighboring landowners, proposed the site to local leaders as a possible location for Amazon’s HQ2. He said he didn’t know, however, if the Metro Denver Economic Development Corp. ultimately included it in the region’s submission to the company. Thomas covers commercial real estate, development and law. He is a graduate of the University of New Hampshire and previously worked as a business reporter at the Springfield News-Leader. Email him at [email protected]. 2 Comments on "Former Denver Post plant in Globeville rezoned for 12 stories"
I bought my home nearby to this plot, and I have been waiting almost 4 years for something….ANYTHING to sprout up on that parcel. It’s like waiting for the 2nd coming of christ. Just never gonna happen in my lifetime.